Sherburne SWCD provides programs to protect our soil & water resources and promote best management practices for the land & water use. 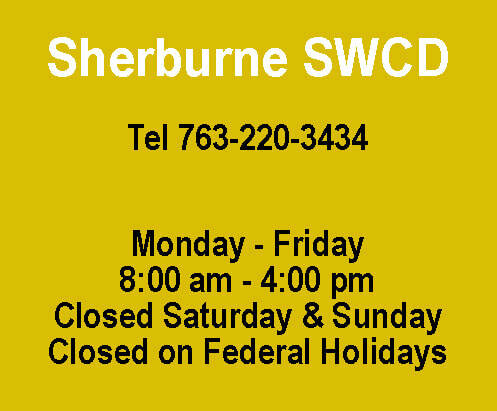 Following is a list of some of the programs and services provided by the Sherburne Soil and Water Conservation District (SWCD). Tree, windbreak, shelterbelt, & living snowfence planting plans. Prairie & pasture planting service. Upland & wetland habitat restoration/enhancement. water & sediment control basins, grass waterways, field windbreaks, etc.